The Greater Rochester International Airport Transformation Includes Terminal Redesign Featuring Upscale Shopping and Dining, a New Façade with Solar Lighting, and a Digital Information Hub. On April 25th, 2017 Governor Andrew M. Cuomo announced the groundbreaking of the $53.7 million transformation of the Greater Rochester International Airport into a state-of-the-art transportation center. The Governor was joined by the Monroe County Executive, Cheryl Dinolfo and the City of Rochester Mayor, Lovely Warren. The airport&apos;s transformation will redesign the terminal building to incorporate sustainable elements such as solar panels and rainwater collection, new signage, enhanced security measures, new technology to improve accessibility, and premier shopping and dining options to improve the overall traveler experience. 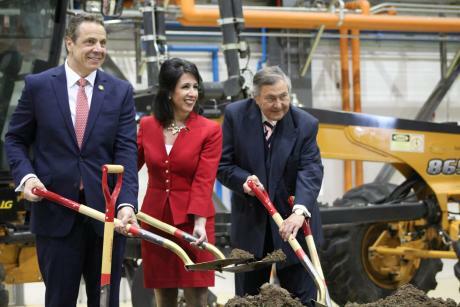 "An airport is a mini economic center in and of itself," said Governor Cuomo. "The airport is a place where you can have a meal. Where you can meet somebody and have a business meeting. Where you can do business at an airport some people never even leave the airport and go into the city...An airport is a destination in and of itself now." "The airport says, "Welcome to Rochester. This is who we are." And the architectural significance of your wave in the front of the airport I think is magnificent. It&apos;s creative. It&apos;s different. It&apos;s unique. It&apos;s you. It&apos;s your signature. It says so much about the Finger Lakes. It says, "We&apos;re creative. We&apos;re innovative. We&apos;re exciting. We&apos;re outside the box. We&apos;re not just institutional." And I think it&apos;s going to have a profound effect on people who not only visit, but people who are in Rochester, in Monroe and who are going to use the airport, and it will be a unique signature. People fly in and out of airports all day long. They will remember when they fly into this airport because of this architectural significance." The Greater Rochester International Airport supports nearly 10,000 jobs in the Finger Lakes Region, and funding through this program will increase economic opportunity, expand retail options, and improve the overall passenger experience for a region undergoing continuing growth. A wide-scale redesign of the terminal building, adding premier shopping and dining options. A new façade and architecturally significant design featuring a solar canopy over the skyway from the parking structure to the terminal. The canopy will enhance security and support sustainability with solar panels for night-time lighting and rainwater collection for landscape irrigation. Enhanced safety measures and realignment of TSA scanners to minimize wait times at the security checkpoint. A state-of-the-art smart phone lot where family and friends can wait for passengers while monitoring up-to-the-minute arrival information on a viewing screen. The new lot will be built before the terminal, eliminating the current need to drive past the terminal to get to the lot, then circle back to check on arriving passengers, and will feature electric car charging stations. Color-coded navigation between Concourses A and B, a digital information hub visible to passengers heading to either concourse. New windows with energy efficient glass bringing in additional sunlight. Bluetooth connectivity providing wayfinding, flight status and gate information, tablets and USB charging stations. A play area designed with input from The Strong National Museum of Play. New signage and landscaping at the Brooks Avenue airport entrance and other locations on the property. Improved LED roadway lighting will also be included. Enhanced accessibility, incorporating state-of-the-art technology engineered by the Rochester Institute for Technology’s National Technical Institute for the Deaf, making travel easier for the hearing impaired. A feasibility study about creating an on-site business incubator to further expand and develop accessibility technologies for airports. The infrastructure is slated to be completed by the end of 2018.